The timer of "Don't Sleep " can already be set. Please first set the checkbox "Use timer". Then change the time, or set via the date and time fields (see Image 1)! 1.) ... Activate the dont sleep timer! 3.) ... Select the action when the time has elapsed! Back to: ► Don't Sleep! 1.) Activate the dont sleep timer! is automatically set to one hour. PS: But will change it in the next version so that there is no confusion. 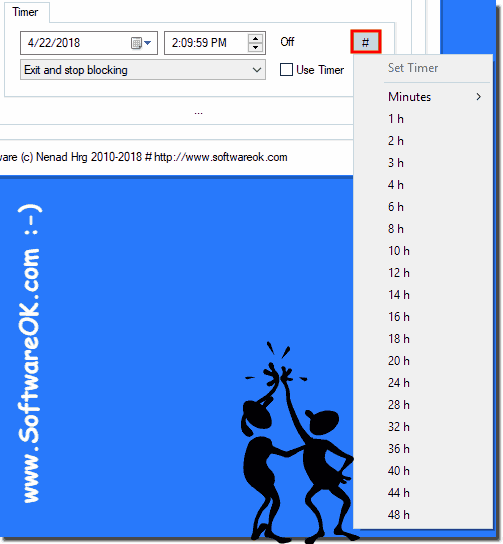 (Image-1) The timer prevent standby in Windows-OS! (Image-2) Set the prevent standby timer! 3.) Select the action when the time has elapsed! (Image-3) What happens when the timer expires! Setting the Windows standby / hibernate time can be as easy as you can see in the Windows 10 shot screenshot above, but you can safely use this standby timer example on earlier versions of Microsoft's Windows operating systems It does not matter whether you use the Standby Timer example on a Windows desktop computer, or on the go on the Tablet PC or Surface Pro / Go, or even in the Office on a Business Server operating system. It really makes sense to use and use this standby timer in Don't Sleep, whether in the new MS Windows 10 OS or on one of the older MS operating systems it has been tested and successfully verified at all. DontSleep - FAQ-7: The timer can not be set to prevent standby, why? 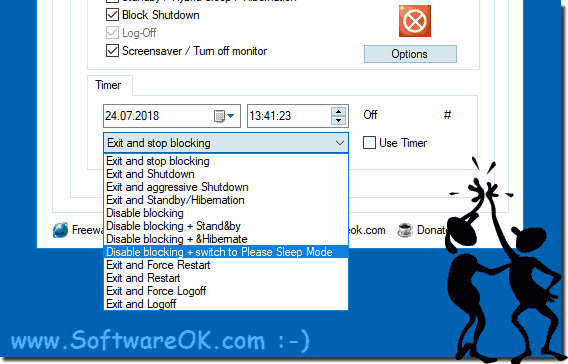 Prevent sleep timer for windows 10, 8.1, 7 how to use it? 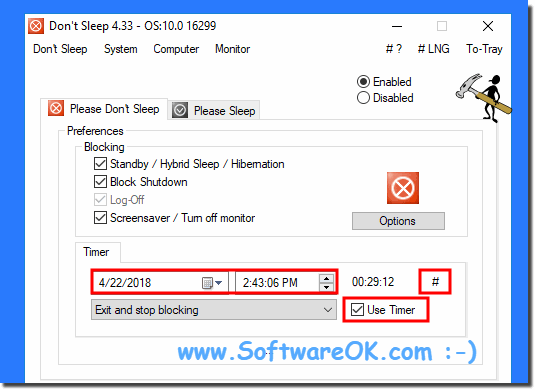 The prevent standby timer how to works in don't sleep! ?